DO I BUY AN ANTIQUE OR SHOULD I GET A NEW TRACTOR ? The Craftsman lawn tractor was too small for plowing snow, grading gravel, and hauling firewood. So I started seriouisly looking for a real tractor. I did not speak tractor and had no idea what used farm tractors should cost. Browsing the classifieds was very frustrating. Everything less than 10 years old was either way out of my price range or a complete basket case. Tractors hold their value much better and last much longer than most cars. It was still difficult to accept that the tractors in my price range were 50 or 60 years old. The vintage gas-engine tractors were a good deal for me because most people would be looking for diesel tractors that require less msintenance. I became interested in Grey Market tractors. Grey Market tractors are inexpensive used tractors imported mostly from China and Japan. Beginning in 2003 Japan began passing emissions laws that made it illegal to continue operating tractors that do not meet the new standards. Similar emissions laws have been passed in the USA, but only apply to new tractors. Thousands of used tractors that became illegal to operate in Japan were being shipped to North America and sold much cheaper than similar tractors made by the same manufacturers for sale in North America. Manufacturers such as Kubota, Mitsubishi, and Yanmar will not provide parts, service, or support for used tractors that have been imported by various independant operators. Grey Market tractors were not manufactured for sale in North America, and do not meet various safety standards. The manufacturers view grey market tractors as unfair competition and bad publicity Manufacturers such as Kubota, Mitsubishi, and Yanmar have been making and selling tractors for sale in the USA. through various dealer networks. to the US. Ine In some cases local laws these tractors have become Since these tractors were not intended to be sold in the US they do not It seems there is no market for used tractors Apparently there is very little local market for the used machines, so they are shipped to the U.S. and sold by various importers. The major down-side to grey market tractors is a lack of local dealer support. All of these grey market tractors are made by the same companies that also make tractors sold in the US through various dealer networks. Those dealer networks correctly view all Grey Market tractors as unfair competition. Tractor models that were intended to be sold in the US had to meet higher safety standards and were more expensive. These cheaper tractor cousins may be able to use many of the same replacement parts, but the dealers are not going to be of much help cross-referencing parts when they find out what you have bought. After that dead-end, I knew I was looking for an older model tractor that was made in U.S.A. The model I was looking for would have been made in enough quantity that there would still be a large number of them in use. If there are still a lot of them in use, parts should be easy to find. There is only one tractor that kept coming up in every search, the Ford N-series Tractors. The Ford N-Series tractor started a revolution in tractor design but there were going to be drawbacks to a tractor built more than 50 years ago. 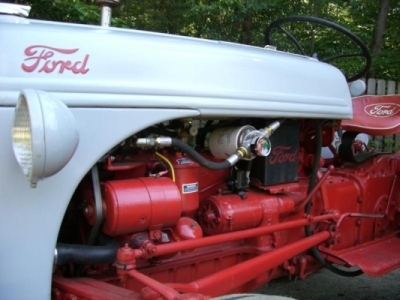 Even though they were built from 1939 to 1952, prices for all of the Ford N-series tractors appeared to be about the same. So the search was quickly narrowed down to a 1948-1952 8N. That way the tractor would have as many factory improvements as possible. The results of my research are not unique. Many other first-time tractor owners have done the same research, and come to the same conclusion. The N-Series tractors are plentiful, very inexpensive, and they are the first mass-produced tractor with a "standard" 3-point lift suitable for most modern implements. For these reasons many first-time farm tractor owners end up choosing one of the Ford N-Series tractors. The tractors remain very popular, and there seem to be more web sites and parts suppliers dedicated to these tractors than for many newer tractor makes and models. Now for the drawbacks - The N-Tractor 3-point lift is basically a Category 1 but not exactly. The Ford/Ferguson lift was developed by Harry Ferguson many, many years before there was any standard for such things. The N-Tractor lift may not match up perfectly to every implement. Vehicle electrical systems back in the day were 6 volts, positive ground. Running any modern 12 volt, negative ground accessories would require a separate 12-volt system, or a conversion to 12-volts. Safety features such as Roll Over Protection Systems (ROPS) were not standard equipment. Live Hydraulics, and Power Take-Off (PTO) did not appear until later models. The hydraulics and PTO on the older tractors generally do not work separately from the drive train. Step on the clutch, and everything stops. This makes it difficult to use some implements since you cannot decrease ground speed without also decreasing the PTO speed. You cannot raise the hydraulic lift when the clutch is depressed. Having the PTO directly connected to the drive train also creates a dangerous condition with implements that store energy such as rotary cutters. The rotating blades in a cutter have a lot of momentum. Depressing the clutch only disconnects the engine from the drive train. The PTO runs off the transmission input shaft AFTER the clutch, so the implement will continue to power the tractor tires until the blades stop turning! This feels like trying to stop a truck with a large trailer behind it. You stand on the brakes, but it just keeps going, and going... That is a really good way to knock down a fence, run into a tree, off a cliff, or any number of other things that will just ruin your day (if you are lucky). Enter good old American ingenuity! 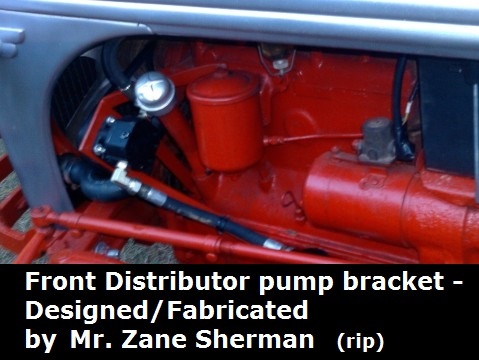 The solution to the lack of Live Hydraulics on the N-Series tractors was designed by a gentleman named Zane Sherman in Talledega, Alabama (RIP 1935-2018). The "secret" to adding live hydraulics is really very simple. All you need to do is mount a small hydraulic pump where it can be driven by the crank or the fan belt. Then run a some hydraulic hoses to draw fluid from the bottom of the sump, and provide pressure to the test port on the original hydraulic pump. The most difficult parts are fabricating the pump brackets, and making an adapter to connect a hydraulic hose to the test port. The intent is to provide pressire to the hydraulics whenever the engine is running, so your lift will still work when you hit the clutch. There are some operational glitches with this setup. With both pumps running and the engine revved up, you may need a heavy implement on the lift for it to go down. You will certainly notice that the lift goes up much faster than it goes down. This is because the valving in the pump is now seeing double the original flow. In order to get around this, I usually leave my PTO switched off. This lets me run a back blade with about the normal hydraulic flow so my lift works as it should. Another glitch is that with the typical front-mount pump, the lift will no longer stay up when you switch the engine off. The system now has a path to bleed down through the pump as soon as it stops. The simple solution for that is to add a one-way valve somewhere in the new plumbing that will plug the leak when the pump stops. You can use a larger pump and add valves if you want to run things like a FE loader. However, the plumbing can get complicated. Also, the hydraulic system on these tractors cannot handle more than about 2 GPM. If your accessories need more than 2 GPM you will probably need to add, valving and another line to divert the extra flow directly back to the sump. Again, this can get complicated. You need to work with someone who really understands hydraulic systems in general as well as the system on these old tractors. The live hydraulics pump on my 52 is tucked under the hood above the generator. I added a strainer with a gauge so I could see when it was time to change the strainer cartridge. Adding filtration to the system seemed like a good thing. Unfortunately, adding any filtration caused problems with cavitation when the fluid is cold. The solution to provide safe use of the PTO is an over-running clutch. This is basically a ratchet that only allows the PTO to power the implement and freewheels when the implement tries to drive the tractor forward. If you are using a front end loader or even a front blade on your 8N tractor, Jackson Power Steering has a complete bolt-on power steering unit for your 8N. From around 1967 to 1985 U.S. tractor manufacturers did offer ROPS as an option. Farmers generally did not pay for the optional protection unless they wanted a cab. The OSHA regulations most often mentioned, have never applied to tractor manufacturers or small farms. The actual OSHA regulation requires that agricultural tractors over 20 horsepower manufactured after October 25, 1976 meet the following requirements: A ROPS must be provided on each tractor operated by an employee. In addition, OSHA regulations were only enforced for farms with 11 or more employees. Even today, there are no laws or regulations that specifically require tractor manufacturers or small farms with fewer than 11 employees to provide ROPS. Beginning in 1985, U.S. tractor manufacturers began voluntarily including ROPS on all farm tractors over 20 horsepower. Vintage tractors were made to last. Most of the things that wear out can be easily rebuilt. Tune-up parts are still available, even for the oldest machines. Many vintage tractors still in use today were built long before ROPS were even offered as an option. Many farms still keep a vintage family tractor for odd jobs the much larger modern tractors cannot do. Even though not specifically required by law, it is a good idea to add ROPS to any working tractor. It may also make sense to add FOPS if you frequently work where trees, branches, rocks, and other things fall. Unfortunately, most of the tractors that certainly should have been fitted with ROPS remain completely unprotected today. This is mostly because farmers have been strongly discouraged from building their own, and the certified ROPS are much more expensive than most farmers will spend for something they could knock-together out of scrap for nothing. A certified ROPS is designed and tested for a specific model of tractor and must be properly installed with the correct hardware. The engineering that goes into any certified ROPS is not obvious. The ROPS must flex to some extent, so welds and hardware do not break. While flexing, a ROPS must still provide a protected zone for the operator. Folding is fairly standard these days for just about anything that has a ROPS, FOPS, or sunshade. The tractor still needs to go under tree limbs and thru barn doors. A folding structure is more complicated to build and adds cost. Buying a used ROPS and installing it is not recommended, unless the used ROPS was taken from the exact same model of tractor, and it is properly installed with the correct hardware. The best place to get a certified ROPS is from the dealer that still provides parts and maintenance for your tractor. A few states have funding provided for an incentive program that will pay 70% or more of the cost to add certified ROPS to your tractor. Do the research and see what may apply in your case. Virginia currently provides zero funding for the ROPS incentive program. It is tiresome to be repeatedly referred to a program that is only funded in 7 out of 50 states. The full cost to have a certified ROPS added to a tractor is often more than many vintage tractors are worth. Some owners have just gone ahead and built "sunshade" support structures based on a factory ROPS design. Most of these certainly appear strong enough to provide more than just protection from sunburn. There are also some homemade cabs and structures that would be more likely to cause injury than provide any protection in a rollover. A few people have built the Cost-effective ROllover Protective Structure from plans published by The National Institute for Occupational Safety and Health (NIOSH). CROPS . Unfortunately, the NIOSH bolt-together CROPS design is much more complicated than any factory ROPS, still requires welding, and also requires use of shop equipment that can bend 1/2" steel plate. Many people see the NIOSH design as a step in the right direction, but poorly designed. Hard to believe this is what they came up with for a "Cost-effective" Rollover Protective Structure. The main issue with building a custom ROPS is liability. Lawyers will flock like vultures to any incident involving an uncertified ROPS. Product liability laws have become so twisted, everything we do can be scrutinized and become grounds to lay blame anywhere but on the idiots who should be responsible for their own unsafe actions. Product manuals have become a useless joke. Manuals are so crammed with warnings and cautions it is nearly impossible to find actual instructions. Building a tree fort used to be just kids having fun. Today, the property owner risks being sued for not having proper code-compliant railings and a limitless number of other details. Based on the current choices available, it appears that the preferred option is to have a factory-built certified ROPS installed by a dealer. Expect to pay at least $1000 for a certified ROPS, plus the dealer installation charges. Based on current laws, and the number of ambulance chasers being added to the population each year, that is my official recommendation regarding ROPS. The requirement for certified ROPS makes perfect sense for a tractor weighing more than 4-tons. Applying the same requirement to the average 20hp tractor with a maximum loaded weight usually much less than 4-tons is ridiculous. In fact, most of the larger tractors are not the problem, they already have factory ROPS. The requirement for certified ROPS, and that a ROPS should be installed by a dealer, has been completely counter-productive for most of the tractors that do not have a ROPS. The result is that most antique tractors remain completely unprotected many years after it became common knowledge that all tractors should have a ROPS and seatbelt. Perhaps 4-tons is not where that line should be, but obviously there is a huge difference between building a roll bar for a Ford 8N and a Ford FW-60. There are millions of race cars all over the planet with roll bars and roll cages. By far, the most popular construction material is mild steel. Most of these roll bars and cages are welded using whatever type of welding equipment happens to be available. In my youth, I drove a stock car at the local circle track for three years with a roll cage that I welded with a stick welder. NASCAR officials inspected that car before every race, and there was never any question about the quality of the welding. Over the course of three years, some tubes got bent, were cut out, and new pieces were welded in. No weld ever broke, and no bars ever cracked or broke loose. Only in the top classes of various racing organizations do things like chrome moly and MIG or TIG welding become mandatory. Building a simple roll bar for the average small farm tractor is not difficult. There is absolutely no reason every tractor does not already have a decent roll bar and seat belt. It is obvious that even a small farm tractor could weigh twice as much as most racing vehicles, but speed has far more effect on kinetic energy than weight. For example: a 2500-pound car going 80 mph has about 40 times the kinetic energy of a 4000-pound tractor going 10 mph. The existing certified ROPS designs are not several orders of magnitude larger/stronger than a roll bar for a typical off-road truck. Copying a factory ROPS design, including the correct size and grade of hardware, is not nearly as difficult as some experts claim. There will always be people who will use cheaper materials and ungraded hardware. Only a moron believes that this only applies to individual fabricators. The lawyers insist on factory-built mostly because manufacturers have deep pockets and will likely decide to quickly settle any case. Lawyers get paid, but the operator who paid for a defective factory ROPS is still dead. Perhaps calling it a ROPS is what brings out the lawyers and PHDs with nothing better to do than tell us what we shouldn't do for ourselves. Few people are going to pay more than $1000 for something they can easily build for a lot less. A few states do have programs and funding available for the National ROPS Rebate Program (NRRP). That program makes it possible to have a certified ROPS installed for less than it would cost to purchase the proper materials. In that case, spending more money and time building your own version is just dumb. Unfortunately, that program is currently available in only 7 out of 50 states, and even where funding is currently available, they may only allow one tractor per farm per year. Program requirements vary slightly in each state and it is not clear exactly how "farm use" is defined. Virginia is not one of the states with funding for this program, so my small farm tractors will most likely end up with "sunshade supports" that are built better than any ROPS designed for similar size/weight tractors. If you happen to live in a state that has funding for the National ROPS Rebate Program (NRRP), check with your nearest dealer, and have a ROPS installed. Here is a link to a company that makes ROPS for the 8N tractors: Hercules. The USA and Canada distributor for Hercules is Just Tractor Parts of California. Last time I looked their site was still under construction, but there was a working shopping cart and a phone number to contact them at: justtractorparts.com. Some manufacturers require ROPS to be orderd by and shipped to a dealer. After pricing steel and hardware to build the CROPS, it appears the design completely fails to be "cost-effective" by several hundred dollars. Most people looking to build their own ROPS will not have access to a machine that can bend 1/2" steel plate. Most of them will be planning to do their own welding. All factory-built certified ROPS that are available for the N-Tractors are a much simpler design, that would be much easier and cheaper for anyone to build. Any manufacturer understands the value of using less steel, less tooling, and a less complicated design. Many people have built their own roll bar or sunshade based on the simple commercial ROPS designs. I will leave the link to CROPS since it is the only known solution that the government says can be built by an individual and the plans do have useful information regarding materials, dimensions, and hardware for some tractors.